Dan, G., Martin, G., Yosi, S., Dario, B. and Asaph, A. (2017). 1-MCP (1-methylcyclopropene) Treatment Protocol for Fruit or Vegetables. Bio-protocol 7(10): e2278. DOI: 10.21769/BioProtoc.2278. 1-MCP (1-methylcyclopropene) is a simple synthetic hydrocarbon molecule that interacts with the ethylene receptor and inhibits the response of fruit or plant to ethylene. 1-MCP has opened new opportunities in handling harvested crops and serves as a powerful tool to learn about plant response to ethylene (Watkins and Miller, 2006). 1-MCP is manufactured by Agrofresh and known by its commercial name SmartfreshSM. Application of 1-MCP can serve as a powerful tool to examine the response of the plant to ethylene. The commercial production of 1-MCP by Agrofresh allows simple practice of this treatment, especially postharvest. The application of 1-MCP to plants, fruit or vegetable was mentioned in many articles but was not described in detail. This was the motivation to provide the following protocol. In this protocol tomatoes served as candidates for the treatment. Gently pour 0.82 g of 1-MCP powder into the 1,000 ml volumetric flask and close tightly with the rubber septa. Inject a volume of 50 ml of water into the closed flask (5 times, 10 ml of water) and dissolve the powder to release the 1-MCP gas (Figure 1A). Turn the volumetric flask upside down to check that the gas volume is 1,000 ml otherwise add water up to the marked line (Figure 1B). Figure 1. Preparation of 1-MCP gas stock and application to the tomato fruit. 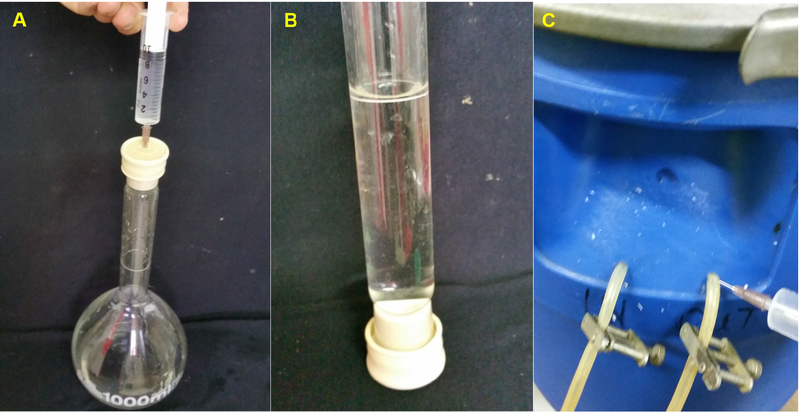 A. Injection of water into the volumetric flask through the rubber septa; B. Volumetric flask filled with water up to the marked line to allow accurate volume of gas; C. Injection of 1-MCP gas through flexible latex hose into the closed barrel with tomatoes inside (Pictures: Dan Gamrasni). Place the tomatoes (It is recommended not to exceed over one third of the barrel volume) inside the barrel and close the lid tightly. You can use wrapped plastic or other solution to prevent any gas leakage. The tomatoes and the barrel should be placed in a 20-25 °C room. To apply 1 ppm of 1-MCP: injection of 30 ml of 1,000 ppm 1-MCP in 30 L barrel will give a concentration of 1 ppm 1-MCP to the tomatoes. Where, C1 = the concentration of 1-MCP gas stock in the volumetric flask (ppm); V1 = the unknown volume of the 1-MCP gas stock sample that should inject into the Barrel (ml); C2 = the wanted concentration of 1-MCP in the barrel (ppm); V2 = the volume of the barrel (ml). The application of 1-MCP: Inject 10 ml of water into the volumetric flask (1-MCP) through the septa, draw up 10 ml of 1-MCP gas and inject immediately into the closed barrel through the flexible latex hose or the septa (Figure 1C). Repeat step 2c two more times until injecting a total of 30 ml 1-MCP gas into the barrel. Open the barrel and air the tomatoes for at least 2 h to allow the tomatoes to adjust to the atmospheric environment. It is possible to measure ethylene levels and/or carbon dioxide in the barrel before opening. As a control, untreated tomatoes should be placed in similar conditions without 1-MCP or any other gas treatment (Figure 2). The volume of the tomatoes should not exceed one third of the barrel to prevent CO2 accumulation if quicklime is not available, otherwise use bigger barrel (200 L) or do the treatment to smaller samples of tomatoes in few barrels. To prevent carbon dioxide accumulation due to fruit respiration in the closed barrel, it is possible to add 0.5 kg of quicklime (known as burnt lime) that will spontaneously react with CO2 from the air (you can keep this powder in any paper bag). It is possible to use the 1-MCP stock solution up to 2 weeks keeping the volumetric flask upside down at low temperature (4 °C). The protocol was adapted from Gamrasni et al. (2010), and was similarly applied in Breitel et al. (2016). We would like to thank RIMI and Agrofresh Inc. for the supply of 1-MCP. Breitel, D. A., Chappell-Maor, L., Meir, S., Panizel, I., Puig, C. P., Hao, Y., Yifhar, T., Yasuor, H., Zouine, M., Bouzayen, M., Granell Richart, A., Rogachev, I. and Aharoni, A. (2016). AUXIN RESPONSE FACTOR 2 intersects hormonal signals in the regulation of tomato fruit ripening. PLoS Genet 12(3): e1005903. Gamrasni, D., Ben-Arie, R. and Goldway, M. (2010). 1-Methylcyclopropene (1-MCP) application to Spadona pears at different stages of ripening to maximize fruit quality after storage. Postharvest Biol Technol 58(2):104-112. Watkins, C. B. and Miller, W. B. (2006). A summary of physiological processes or disorders in fruits, vegetables and ornamental products that are delayed or decreased, increased, or unaffected by application of 1-methylcyclopropene (1-MCP). How to cite: Dan, G., Martin, G., Yosi, S., Dario, B. and Asaph, A. (2017). 1-MCP (1-methylcyclopropene) Treatment Protocol for Fruit or Vegetables. Bio-protocol 7(10): e2278. DOI: 10.21769/BioProtoc.2278. please tell me the exact protocole for apples treatment, i need to treat with 1 PPM of 1 mcp and the a.I. is 0,14 %, how should i use it please ! However apply 100 mL of 1-MCP gas instead of 30 mL as mentioned in procedure section 2b if you need 1 ppm. Although, it was in preliminary experiment, I used, in a rather conclusive way this protocol without any modifications. How are you!!! Iy=t is Danny from Israel. If you have any problems with that please let me know. I do this protocol very often with no problems. I never used this protocol. Whenever you need it and there might be any questions you are welcome to ask me.